Purchased as a gift for my Husband and he loves tthis watched. The style and size is perfect. Love the brown and navy blue blend. Nice packaging and fast delivery. The price is well worth it. Handsome looking watch. Diesel watches are oversized, colorful and eye-catching with uniquely-shaped cases. 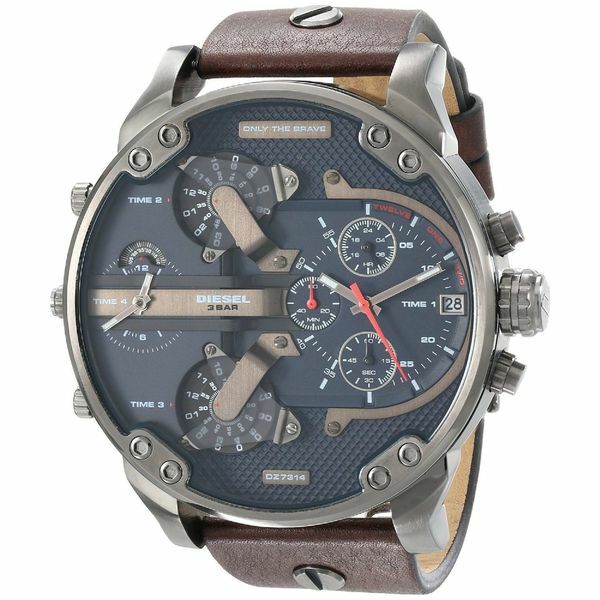 From chronographs to digital to multiple time zones, this men's watch from the Mr. Daddy 2.0 collection features a brown leather strap and blue chronograph 4 time zones dial. Difficult to set other modes on the watch, overall good. "How can i ship the watch to kenya"
Yes, this does ship to Kenya.